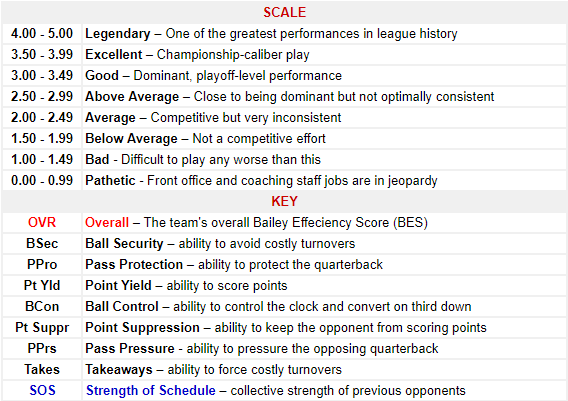 Our Week 3 BES Rankings arrive after a historic weekend that saw the league politically galvanized by controversial remarks from the President of the United States. It was also a weekend of dramatic finishes and rampant upsets that left many failed prognosticators in its wake. 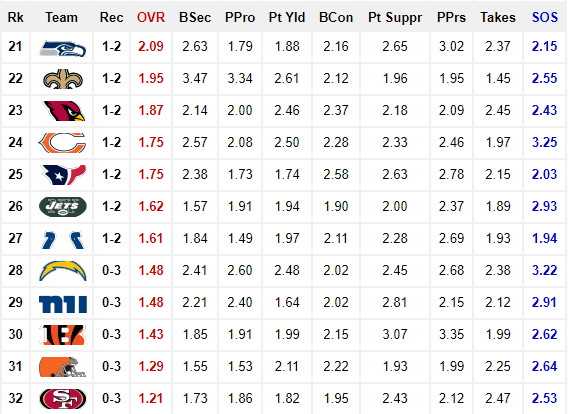 As a result, the BES was 8-8 (.500) predicting Week 3 outcomes based on our Week 2 report. That brings our season total to 19-13 (.594). Additionally, the BES Top-10 features five new teams this week. Four of them – the Bills (2-1), Jaguars (2-1), Cowboys (2-1) and Eagles (2-1) – are returning after opening the season among the top-10 in our Week 1 BES Rankings. The Chiefs hold on to their top spot for a second consecutive week. Most notably, their BES Overall score has increased from 3.44 to 3.60. Meanwhile, they’ve improved to No. 2 in BES Offense and No. 5 in BES Defense. 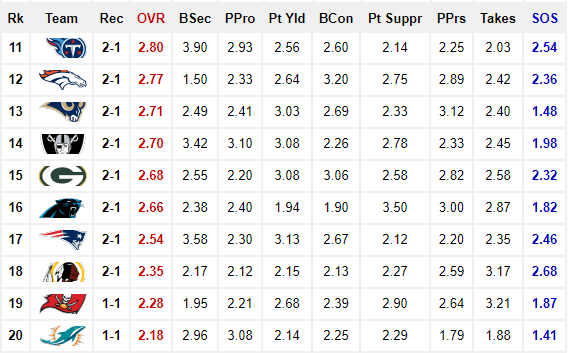 The Chiefs also boast the highest Point Yield (3.30) and Point Suppression (3.15) scores among teams in the BES Top-10. Theses are signs of the Chiefs gathering momentum as they approach a dangerous Week 4 showdown with the Redskins (2-1). Offensively, the Bills were impressive with 67% red zone efficiency against one of the league’s best defenses. More specifically, quarterback Tyrod Taylor was stellar, salvaging 20 of 26 passes for 213 yards and two touchdowns despite unrelenting pressure from the Broncos front-7. 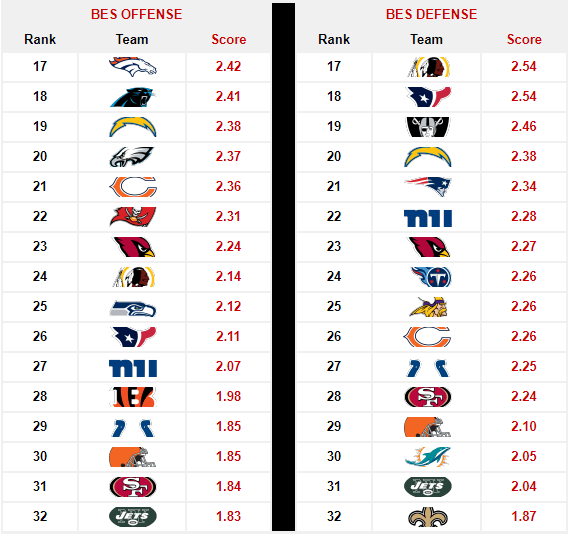 Currently, the Bills rank 12th in both BES Offense (2.66) and BES Defense (2.69). They also own the second highest Ball Security (3.32) score in the top-10. They’ll need to be on their A-game when they visit the Falcons (3-0) in Week 4. Another demonstrative upset of Week 3 was the Jaguars (2-1) staggering 44-7 defeat of the Ravens (2-1). With the win, the Jaguars jumped from No. 16 to No. 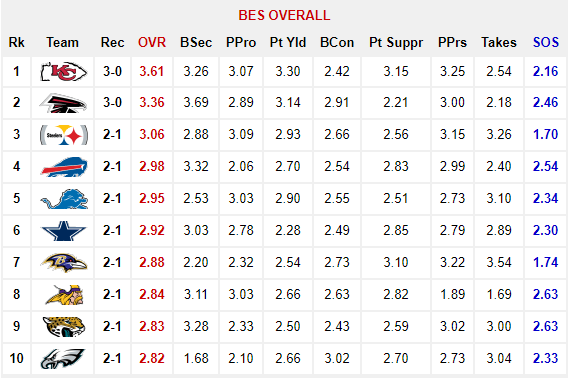 9 in our Week 3 BES Rankings. Likewise, their sheer dominance of the Ravens defense saw them improve from No. 16 to No. 11 in BES Offense. Overall, the Jaguars have the ingredients for sustainable success in a wide-open AFC South. Their No. 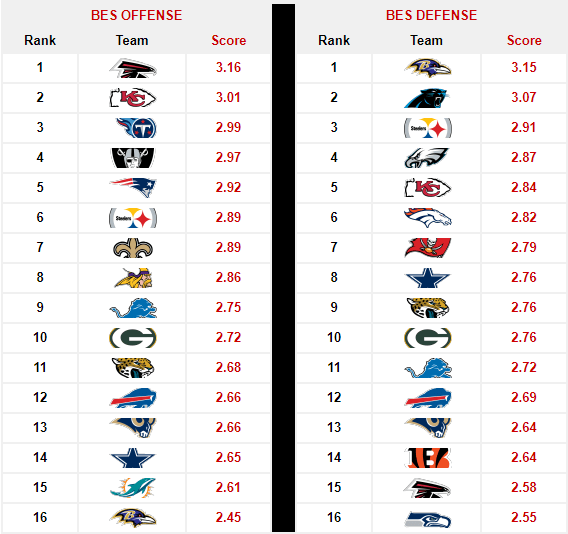 9 BES Defense is emerging as one of the league’s better units. However, quarterback Blake Bortles must build on his Week 3 performance (244 yards, 4 td’s, 128.2 passer rating). If that happens then the Jaguars could be a mainstay in the BES Top-10 where they opened the season ranked No. 4 in BES Overall.